Isla De Las Mulecas (island of Dolls) is the creepiest tourist destination in Xochimilco, Mexico dedicated to the soul of a young girl who passed away at a tender age. The place, which is actually a floating garden, is currently a home of hundreds of terrifying, mutilated dolls. Their severed limbs, decapitated heads, and blank eyes hung on trees, fences and nearly every available surface. The dolls appear menacing even in the bright light of midday, but in the dark, they are particularly haunting. The story behind this haunted island lie in a tragedy that occurred in 1950. Don Julian Santana Barrera, was the only dweller and caretaker of the island. He found a little girl drowned, in a canal surrounding the island mysteriously and he was not able to save her life. Shortly thereafter, Julian saw a floating doll near the canal, assuming it to be the girl’s doll, Julian lifted the doll and hung it to a tree to please the little girl’s tortured soul. A guilt of not saving the girl’s life made Julian restless. He felt that the island was haunted by the girl’s spirit. Only one doll, he felt was not enough to please the child, he felt the girl needed company. Terrified by the spirit, he began collecting dolls which he would find in the canal, from heaps of trash and hung them on the tree to protect himself. Over half a century, he collected more than 1,500 of these little horrors. All the dolls are still there untouched. They look like decaying corpses of children. Later, Santana died of a heart attack in 2001, and a small white cross near the watermarks his grave. Some stories say that he was found drowned in the canal in the same manner as the dead girl. The truth behind the story is still a mystery. Some even doubt the existence of the drowned girl. Some say Julian had made up this story in his loneliness. Some say that Julian had gone mad and felt that the dolls were the tortured spirits of children who passed early. People close to Julian say that it felt as if he was driven by a certain force, which had changed him completely. His cousin Anastasio lives on the island, running it as a tourist attraction. At night, he says, they come alive. “They will move their heads and whisper to each other. 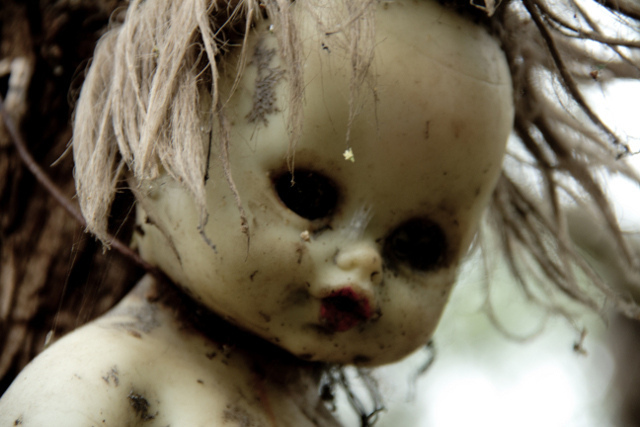 It’s very spooky, but I have gotten used to it.” Walking through these mutilated dolls is a horrifying experience. Broken limbs, body less heads and headless bodies are now covered with mold, Some have become a home for spiders and insects. Julian’s innocent sentiment converted this floating garden into a graveyard of dolls. A place which was supposed to grow flowers , grew dolls.